Happy New Year to all of our bird conservation partners! Some of our NABCI-Canada Committees are now active! The International Committee, Communications Committee and Influence Policy Committee held their first teleconferences in November and December while the Coordination and Track Bird Conservation committees will have their first teleconferences early this year. I would like to give a big thank you to the Council members that have agreed to co-chair these committees. Our Influence Policy Committee aims to work on policies to prevent the spread of exotic species that are harmful to birds. If you would like to know more about our committees or join, visit our committee webpage or e-mail us! We would like to wish farewell to Marie-France Noel, who has been fulfilling the role of NABCI-Canada Coordinator. Marie-France will be working with the Committee on the Status of Endangered Wildlife in Canada (COSEWIC) Secretariat as a Science Officer. If you would like to get in touch with the new NABCI-Canada Secretariat, please contact us through our generic e-mail that will continue to be monitored until a new Coordinator is in place (ec.icoancanada-nabcicanada.ec@canada.ca). The U.S. NABCI Committee recently release National Bird Conservation Priorities! They compiled common themes from national and continental documents, such as the State of the Birds reports, the Partners in Flight Landbird Conservation Plan, the North American Waterfowl Management Plan, the Atlantic Flyway Shorebird Initiative plan, and the Pacific Americas Shorebird Conservation Strategy. From these reports, they created a comprehensive document that incorporated priorities across bird partnerships. The U.S. NABCI Committee then voted on the highest priority actions and winnowed the list to two actions for each of the five themes, yielding a “Top 10” list of priority bird conservation actions. Released in August 2018, the National Bird Conservation Priorities covers five themes of Land and Water Conservation, Research and Evaluation, Engagement and Partnerships, Addressing Threats, and Policy and Funding which should resonate with bird conservation partners as core elements of all-bird, full annual cycle, comprehensive bird conservation. Partners in Flight / Bird Studies Canada: Compared to sun-grown coffee plantations, shade-grown coffee plantations that preserve part of the tree canopy provide higher quality habitat for our neotropical migrants such as the Canada Warbler, the Cerulean Warbler and the American Redstart. Tanya Luszcz, Partners in Flight Coordinator, wrote an article that was published on the Bird Studies Canada blog to make birders aware of the importance of switching to Bird Friendly coffee, which involves rigorous growing standards that could benefit wintering habitats. Read the article here! Let’s celebrate 30 years of EHJV’s success! Canada has 25 percent of the world’s wetlands – 40 percent are within North American Waterfowl Management Plan’s (NAWMP) Eastern Habitat Joint Venture (EHJV, which includes provinces of Ontario, Quebec, Prince Edward Island, Nova Scotia, New Brunswick and Newfoundland and Labrador). Since the EHJV began conserving migratory waterfowl habitat in 1989, over $500M CAD has been invested to secure about 838,000 hectares and influence 31 million hectares of wetlands and associated upland habitats. These conservation efforts have benefited waterfowl and many migratory bird and other wildlife species. The EHJV focus still includes waterfowl, but its focus is now the conservation of all migratory birds. For more information, visit www.ehjv.ca. What the Bicknell’s Thrush lacks in splashy plumage, it makes up for in tenacity. During its annual cycle, this little brown songbird faces deforestation on its wintering grounds in the Caribbean, hurricanes during migration, and industrial activity on the few small patches of high elevation forest in North America that make up its breeding grounds. In recent years, biologists at Bird Studies Canada and New Brunswick forestry companies have been working together to reduce the burden faced by this Species at Risk (Threatened) in the high-elevation New Brunswick forests that make up part of its restricted and fragmented breeding range. At the highest elevations in the New Brunswick landscape, scattered within a vast patchwork of industrial forest stands, is a songbird that few have ever heard and fewer have ever seen. This nondescript thrush with a distinct ‘chook-chook wee-o wee-o wee-o, tee-ti-ter-eee’ song, is the Bicknell’s Thrush. A habitat specialist, this species has one of the most restricted and fragmented breeding ranges of any North American songbird, with approximately 40% of the global population breeding in dense, high-elevation, coniferous forests in Eastern Canada. Bird Studies Canada, as a member of the International Bicknell’s Thrush Conservation Group, contributes to an organized, international effort to study and conserve the Bicknell’s Thrush throughout its range. Since 2002, we have monitored this elusive bird in New Brunswick, documenting a 20% annual population decline between 2002 and 2011. This population decline is echoed by Maritimes Breeding Bird Atlas data, which indicates that the distribution of Bicknell’s Thrush in New Brunswick has shrunk by 40% over the last 20 years. As a result of these population declines, Bicknell’s Thrush has been listed as a Species at Risk (Threatened) in Canada since 2012. In New Brunswick, the forest stands that Bicknell’s Thrushes use for nesting overlap almost entirely with industrial forest operations. Hence, a crucial factor in its recovery is the use of forestry practices that prevent habitat destruction, especially during the breeding season. In particular, pre-commercial thinning (PCT) of regenerating, high elevation forest stands threatens Bicknell’s Thrush, both due to the immediate destruction of active nests, and in the long term by reducing suitable nesting habitat. 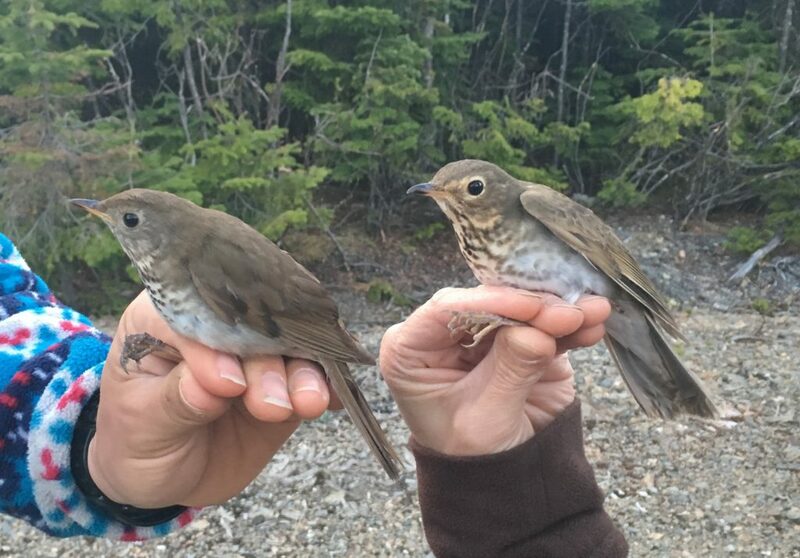 Over many years, biologists at Bird Studies Canada have built relationships with forestry companies operating in Bicknell’s Thrush habitat and there has been collaborative effort to mitigate damage to breeding habitat. We overlay maps of potential Bicknell’s Thrush habitat (identified using habitat modelling) with maps of the planned activities provided by forestry companies, and we spend several weeks in June surveying forest stands for Bicknell’s Thrush. We immediately communicate survey results with the forest companies so they know to avoid PCT in forest stands where we have found Bicknell’s Thrush. Conducting these PCT surveys and communicating with forestry companies has significantly reduced loss of Bicknell’s Thrush and their nests in the industrial landscape during the breeding season, and has raised awareness of conservation issues among our industry partners. Forestry partners have provided ideas for feasible, long-term changes to their operations that will promote long-term protection of Bicknell’s Thrush habitat. In particular, in 2016, Fornebu Lumber exempted from operations a 200-hectare area of high quality Bicknell’s Thrush habitat where both research and surveys are ongoing. In 2017, Bird Studies Canada facilitated and Fornebu Lumber hosted a meeting with regulatory partners, which resulted in Fornebu representatives committing to avoiding PCT in all of their forest stands that fall within Critical Habitat areas designated by the Environment and Climate Change Canada (draft) Recovery Strategy for Bicknell’s Thrush. This significant agreement is a testament to the value of open and reciprocal dialogue between conservation organizations and the people who spend the most time in, and whose livelihoods depend on, the habitat we are seeking to conserve. Together, we have been able to identify areas of research that are mutually beneficial. We recently embarked on a collaborative project in which Bird Studies Canada technicians survey for Bicknell’s Thrush in Fornebu Lumber forest stands that have undergone different management regimes in previous years (i.e., no PCT, partial PCT, or full PCT). This will help us understand how the degree of PCT in Bicknell’s Thrush habitat affects their continued use of this habitat, and the results will be used to develop practical strategies for PCT that maximize the amount of habitat for Bicknell’s Thrush. We are optimistic about achieving meaningful habitat protection for this threatened and declining species through this partnership. This commitment to open and active dialogue from both sides has led to longer term protection for some Bicknell’s Thrush habitat. As well, we continue to use what we’ve learned from our partners at Fornebu Lumber to foster the same collaborative spirit for longer term habitat protection with the other forestry companies that operate in Bicknell’s Thrush habitat. Bird Studies Canada gratefully acknowledges financial support from: Environment and Climate Change Canada, New Brunswick Wildlife Trust Fund, Neotropical Migratory Bird Convention Act, Parks Canada, and Fornebu Lumber Inc.